Reducing operating costs by saving energy is a concept that has moved from discussion to action in shipping circles. 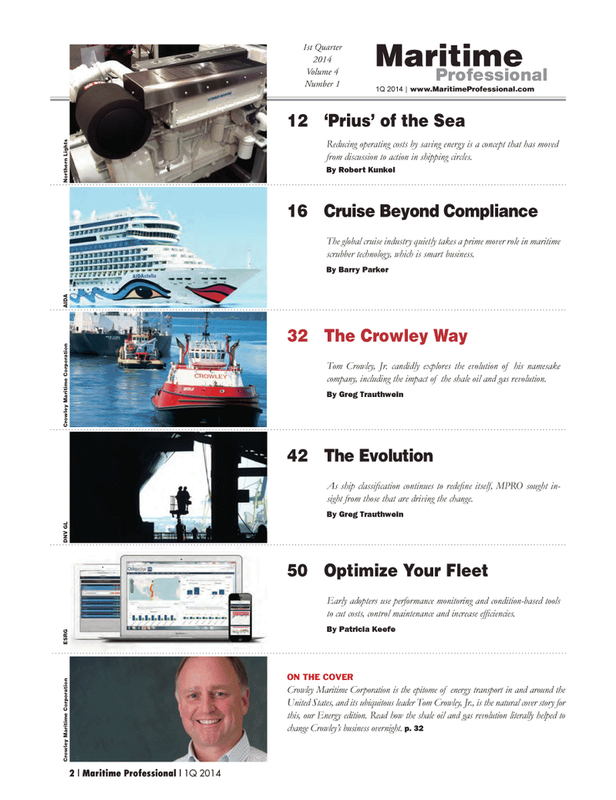 The global cruise industry quietly takes a prime mover role in maritime scrubber technology, which is smart business. Tom Crowley, Jr. candidly explores the evolution of his namesake company, including the impact of the shale oil and gas revolution. As ship classifi cation continues to redefi ne itself, MPRO sought in- sight from those that are driving the change. Early adopters use performance monitoring and condition-based tools to cut costs, control maintenance and increase effi ciencies. scrubber technology Patricia Keefe Maritime Barry Parker Tom Crowley , Jr.